So.. I have a confession to make. Way back in March I refinished my old tile table (and gave my dining area a makeover as well, stay tuned for a post tomorrow) yes, you heard me, MARCH. In case the snow, and lights, and stores and decor haven’t clued you in it is now December. I guess that makes me like, the worst blogger ever? The weird thing about it is that I love, love, LOVE how it turned out. For some reason I just kept procrastinating the actual writing up of the post, but friends, the long awaited day has finally arrived. Six years ago when Bryce and I got married, we were moving into an unfurnished place and had literally nothing and barely any money. We particularly didn’t have money to spend on things like, you know, furniture. We were so blessed at that time by our generous friends and family members hand me downs. Truth be told, we still use several of them to this day! Anyway, at that time, my Grammy and Grandpy gave us this dining table and chairs. I’m not sure how old they were, but they were in great condition. It is a really solid, well built table and I liked the shape and the fact that it could be a small corner table or a bigger oval with the leaf in. BUT. I was not crazy about the forest green tile/oak wood combo. Beggars can’t be choosers though, and it was honestly way nicer than any of our other options so we gratefully accepted it and ate, played and puzzled on it for five happy years. (See, THINGS don’t make you happy, they are nice, but they aren’t everything). Of course the first thing I did was google it, and shockingly I turned up with little to no helpful information, so I decided to wing it because, “what have I got to lose?” I figure if it turned out a nightmare, it would just speed up my buying process, and if it turned out awesome, I saved us big bucks! I am sooo happy with how it turned out, and it has given me confidence to try more furniture related DIY’s. So. I think you might die when you realize how easy this is. Before we start, here are a couple of lovely before pictures for your viewing pleasure. Okay, now that you have a working knowledge of the “before” set, let’s get to work. 1) Move your table and chairs to an area where you can paint. 2) Clean your table and chairs thoroughly and wait until completely dry. 4) Prime again. You heard me. After your first layer is dry prime again. I used two coats of primer on my table and only one on my chairs because, spokes. And, impatience. Anyway, the table has held up like an absolute dream, where the chairs I have already had to touch up once. Don’t take the easy way out, we already skipped sanding, so you need to prime twice, don’t argue! In the above picture you can see the difference. The left side of the table had only been primed once where the right had been primed twice. 5) After your primer is completely dry (follow package directions for how long to wait between coats) you can do the fun part, paint!!! I used a creamy white paint for the entire table. The chairs are a bright yellow and they were just the right, happy touch. I bought both paints and primer at Lowes. 6) After your table and chairs are completely primed, painted and dry, you will need a sealant or top coat of some kind. I used Valspar’s clear sealer in satin finish. If you are using a spray on sealer than you will want to do multiple light coats. You will be able to tell if it pools or squirts out, so don’t get too close and take your time! If you are worried about a being patient, I wouldn’t recommend a spray on kind! 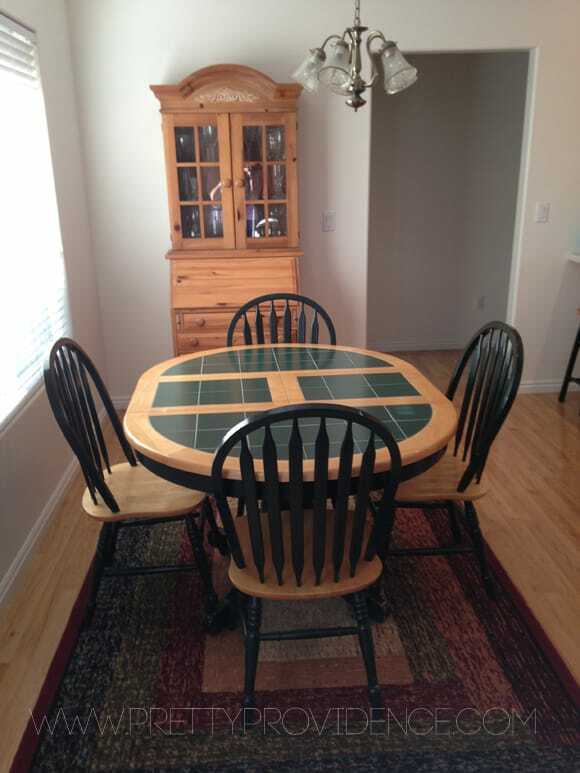 7) Sit back and enjoy your beautiful “new” dining set! It’s ironic that the thing I disliked most about my table before hand (the tile) is now my very favorite part of the table, because it ads texture and interest to the table top without being too bold or distracting! Make sure you stick around to check out the entire dining area makeover reveal tomorrow! Love you guys, and thanks for reading! Also, if you love frugal and AMAZING DIY projects as much as we do, check out our awesome DIY Sliding Barn Door video tutorial! If you like this post, check out 15 DIY Ottoman Ideas or the 24 Amazing DIY Headboard Ideas! This post may be linked up. « Last Minute Christmas Gifts for your Pet or Pet Lover! Hi. I know this is an old post but I have the exact same table and I want to repaint it purple. I was gonna do just the tile but I might do as you have and do the whole thing but my question is can you still put the extension away and have it as a round table?? Did you paint your table yet? I have the same question, although we first tried removing the tiles & that not only didn’t work, but also damaged the extension. So I’m using it as a test piece. So far I’ve primed it twice, plus a little extra in the (black) grout, since some spots were still showing through. I’m painting it white with the same paint we used on our kitchen cabinets: Sherwin Williams Pro Classic. I’m guessing two coats of that will do it? Another question I have is how long does the table top need to cure before putting anything on it? I’ve read as long as a month. You dont actually state whatvpaint you used! Anyone try this since or anyone remove the tiles? 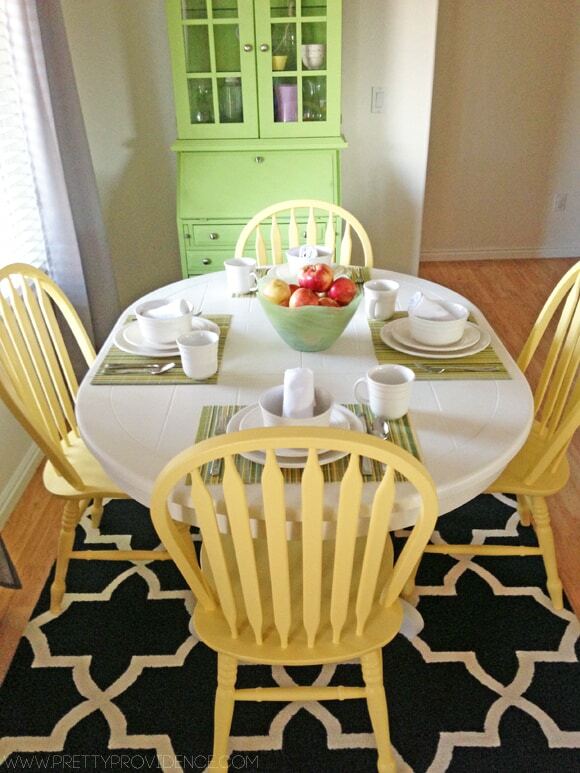 we have this exact same dining table and chairs that were given to us by my husband’s grandma too! It it is a very solid table but I didn’t think it was possible to refinish it with the tile. I was just researching that and came across this post so I am very encouraged! my questions are, approximately how much money did you spend on this project? And how many hours did it take you? thank you for sharing! Oh gosh, it was so long ago I don’t remember the exact amounts but it was probably about $30 for paint and supplies! And maybe five or six hours, but split that up into different coats? Definitely not a huge time or money investment! Good luck! This is The exaCt table i have! I found your post because im in desperate need Of a revamp. It Was also a hand me down for us. i’ve had it for ten years and its held up so well! Jessica, I am trying to find the manufacturer of your table. We have one at our home in Russia and would like to find a source here to save us the cost and difficulty of shipping when we sell our home there this year. Can you help us? Thanks! We have a very similar table , however it is rectangular. It has the same forest green tile. We bought it new in 1997 and it was manufactured by Ashley of North Carolina. This was before they had opened up their own chain of stores. We bought it in San Antonio at Oak Gallery. I am excited to do this! We have that EXACT same table. We’re in an apartment right now so it’s being stored at my parents until we buy a house but I want to fix it up before then so it’s one else thing we have to do after we move! Thanks for sharing your solution! Oh that is so exciting!!! Good luck with yours and your move! 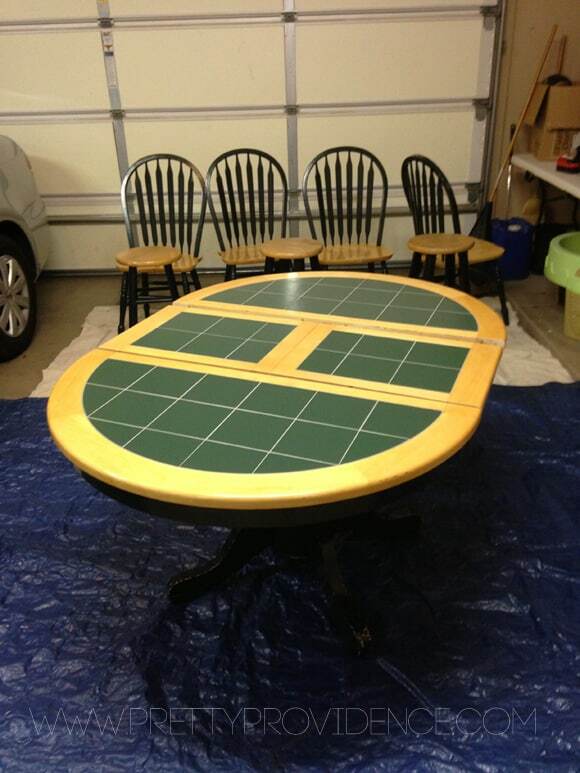 I am moving in with my fiance and we are in the same boat (not much money, trying to re-use hand me downs) and I want to re-paint his old table. 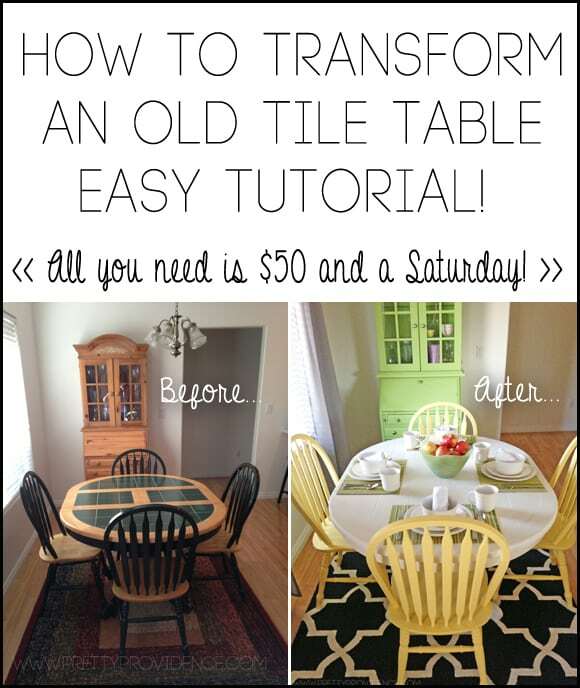 I search “how to paint a tile tabletop and lo and behold, your blog post comes up. THIS IS THE EXACT TABLE WE HAVE! 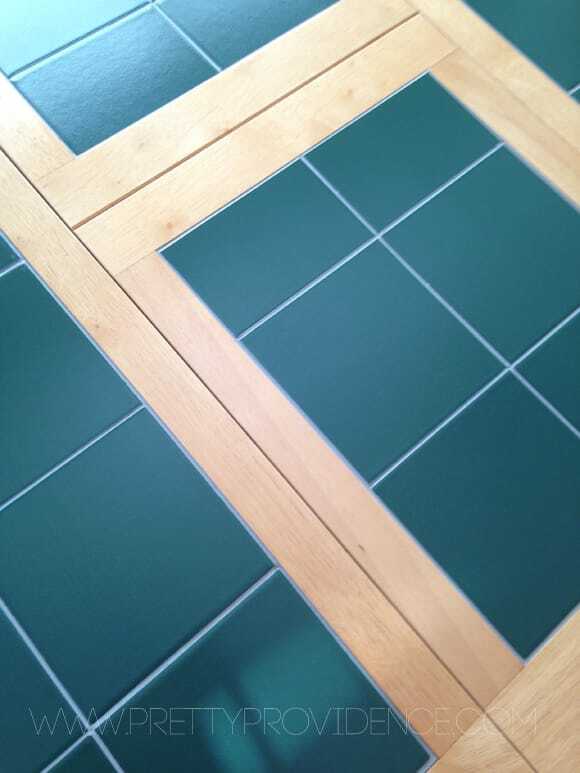 In all it’s green tile and oak wood glory. I’m so happy I found your blog post! Hahaha oh my gosh perfect!!!! I’m so glad you found it and congratulations to you both! I have the exact table but it is rectangle. We also got it from my husband’s grandparents, the thing I hate is cleaning between the tiles!! Do you have a problem with that now? Your set looks amazing! We just did a kitchen makeover, just waiting on counter tops. And no money left for expensive replacement???? Any suggestions would be so helpful!! I totally feel you on that! It actually cleaned easier once it was painted over because essentially you’re not cleaning grout anymore! I hope this helps, GOOD LUCK! This is beautiful!! I have a very similar tile top table, but rectangular with a built in leaf that folds down into the center and 4-legs, rather than pedestal-style. It’s light colored wood and white paint with white tiles. I can’t handle it!! lol Our house has all dark wood / black finishes. It sticks out like a sore thumb but the table has sentimental value so we don’t want to just replace it with a new one. I appreciate you posting this, and it’s happening THIS WEEK! :) Every so happy to have found this via Pintrest! oh YAY!!! I’m so so glad you are excited! best of luck, i’m sure it will turn out great! Hi. what type of paint did you use on the tiles? Was it tile paint or something different?? Thanks in advance. Just regular primer! I believe I note the kind in the post! thanks for the reply, I saw that you put two coats of primer on which I will plan to do also, but I was curious as to what type of paint you used over the primer, didn’t know if it was regular wall type paint or a special type, or if you just did the 2 coats of primer then sealed it? thanks in advance. I realize this is an old post, but I have a table exactly like this that I want to paint. What did you use to clean the table before priming? Is TSP (tri-sodium phosphate) only for before sanding? I just used an old fashioned cloth and got water! It worked great! Good luck- I loved my after! I know this post is older but would love if you could respond. 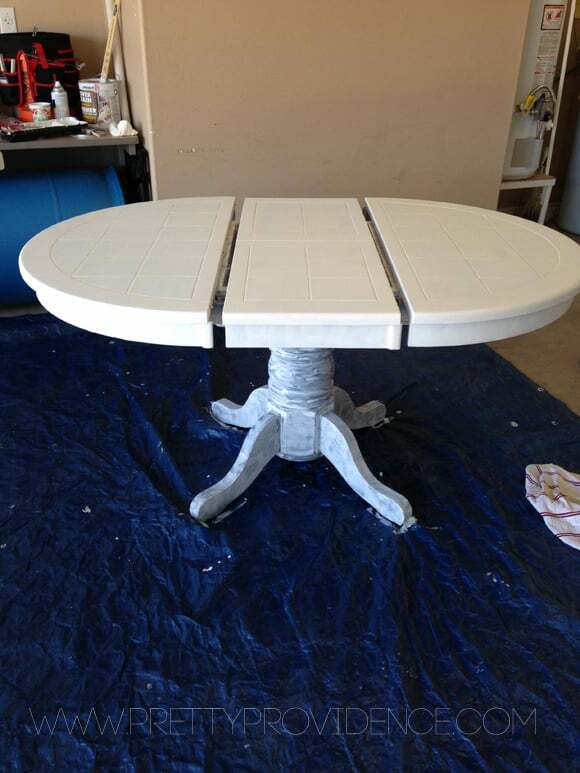 I have the same table and was going to sand but I am so glad to see it can be done by just priming. However the paint is pretty chipped in some places around the base of the table and chairs. Would that affect it at all? It shouldn’t! But if you wanted to just very lightly sand it wouldn’t be a bad idea! I know this post is old, but thanks so much for these tips. We have a huge, sturdy tiled table which is not exactly my style. Not only is it not in the budget to replace, but it was sort of a family heirloom so I hate to part with it. I love this idea and am tucking it away for a future project. yay! I’m so glad you love it! good luck to you! What kind of paint did you use? I was wondering if I could use a chalk paint? did you roll or brush the paint on the table? Or was is spray paint? Is it still holding up? I have the same table and I HATE it!! I love this idea! I actually have the same exact table and I’m in process of finishing now, but I’ve had trouble finding a good sealer. Was the Valspar sealer you used in a spray can? It was, but I am pretty sure they make both kinds! I have the exact table but mine has 4 legs instead of the one base. That ugly green tile has been killing me too! We also got it as a hand me down. I saw that as of last year the paint had held up well. I’m wondering if it still is doing ok? Ours is our main table so it gets a lot of use and abuse(3 small children). 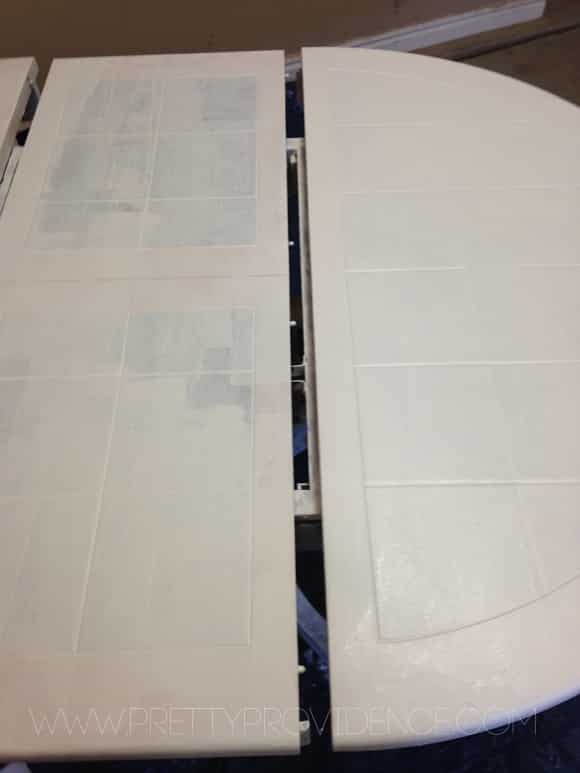 I have seen other tutorials where they use appoxiy on the tile but if all I have to do is prime and paint that’s would save me! Anyway thanks for sharing! I’m hoping this is the answer to my ugly green tile woes. 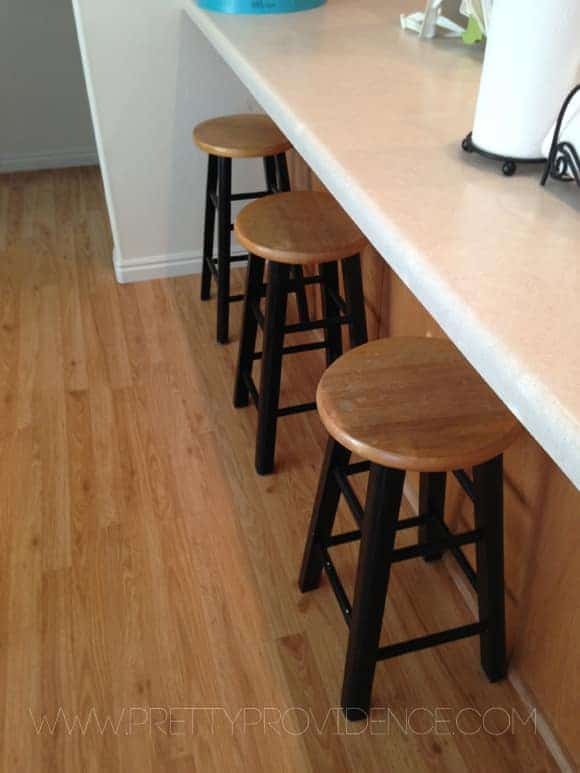 I realize this is an old blog.. Sorry… Did the top coat fill in the grout lines? I have a tile on my table and I hate the way the grooves, where the grout is accumulates grime so bad. 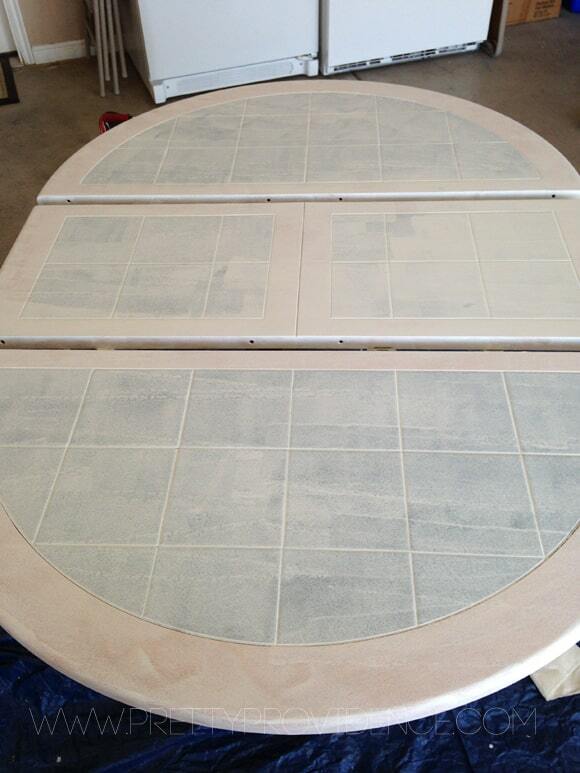 Yucky….. I’m dying to do something to my table and wondered if your table now has a smooth feel to it? Yours looks fabulous! It definitely covers the grout and had a smooth continuous feel, but it still dips down where the grout lines are, they don’t fill in. It just looks patterned, and I actually really like it! It’s easier to clean now as well, since there are no longer actual cracks.. If that makes sense! have the same table but its white and lighter wood! one of the tiles is cracked and I’ve been scouring the internet for a solution ! thank you sooo much! it’s great to hear it has held up to daily use by your toddler! (I have twins who will be 3 in december) I think I’m going to use a darker color for my table though! Really pretty! I’ve had my table forever, and just cant part with it! Mine is pine with white tile but I love your total white look! My base is white so I would only have to do the top and touch up the base! Has the tile chipped? No the tile hasn’t chipped at all! But since your tile is white I wouldn’t even paint it! Id just tape around it! How is the paint holding up on the tiles? Does it chip at all? It’s been a year and the table hasn’t chipped at all! Funny enough, the bottom of the chair legs have a little. I think it’s because I didn’t prime them even close to as well and they are constantly banged into the bottom of the table by my toddler! Ooh, I love how bright and cheery it looks now! Thank you so much!! It really does brighten up our space so much!